A few weeks back, I stumbled upon an online ice cream store and noticed the very peculiar looking Talenti Sorbetto. Now I know gelato, sorbet, and sherbet ....but sorbetto? I was thinking it was just the Italian way of saying sorbet, but I guess I should check: ahh, ok, apparently it IS how you say sorbet in Italian. Well, what do I see in Shaws but the Talenti Roman Raspberry Sorbetto. I know I haven't shown any love for the Whole Foods or Haagen-Dazs sorbets, but I couldn't help myself, it just looks so cool in that little see-through plastic container! (and the brown lid makes it look fancy, don't ask me why). Sure it's $5.99 for a pint, but I gotta try it. 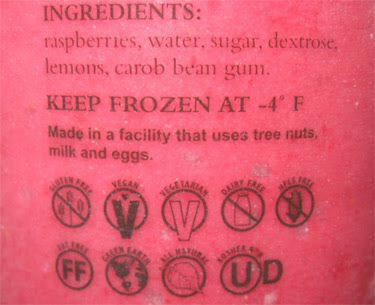 A quick label check makes it all the more interesting: the simple all natural ingredient list is made up of raspberries (good start), water, sugar, dextrose, lemons and carob bean gum. Oh boy, check out all those markings, it's even Vegan! I'm so excited! Let me just wipe off my vegan drool with this nice tasty slab of steak ...oh wait, that wasn't nice. So, it was kinda late, so it's a perfect time for a light, fat-free snack. Unscrew the lid and it's taste testing time! Wow! holy freholy that's potent! I wasn't expecting that ...or maybe I was. I knew it would be different and it certainly gets your attention. I press on with some more small bites but it's really strong. Also, it sounds really funny when you scoop it, kind of like your shoveling snow or something. I'm not trying to be picking, it's just hard to miss. Ok, I don't love it, but ....it's definitely interesting. The Haagen-Dazs sorbet was boring, it tasted too much like eating the stem of the raspberry rather than the actual raspberry. Here, we have a full blown raspberry assault on our senses. It's not like raspberry jam or some kind of raspberry filling, but they are definitely going to for taste here. It's also a more airy product than the H-D (which was very solid) and that makes the Talenti much easier to scoop. I don't love either product, and I'm no sorbet expert, but I definitely give the crown to Talenti. Maybe that's why they say their product is hand crafted and NOT made in large factories. As a future thought, I really wish I had a bit of the Breyers Vanilla left over to mix with it. I didn't though, so I started thinking, and I wonder how this would be on a piping hot brownie with maybe a bit of whip cream on top. Mmmmmmmm, this little bugger is calling for an experiment. We just found this also, and actually loved it. We tried ours topped with a little lemoncello one evening anda little grande marnier the next, both with a few blueberries we had on hand. Can HIGHLY recommend both combos! most amazing frozen treat I have ever encountered in my life! Interestingly enough, I couldn't stand the texture of the sorbetto. I love Talenti gelato, but the sorbetto was a little chalky. Did I get a bad batch or something?? YES, make sure you eat it cold too so it's ICY! lol... "raspberry assault"... hahahaha!!! Well, I tried it for myself for the first time today. I think it's perfect as a serious, alternative palate cleanser after eating something greasy, heavy, or gamey. Best raspberry treat ever! 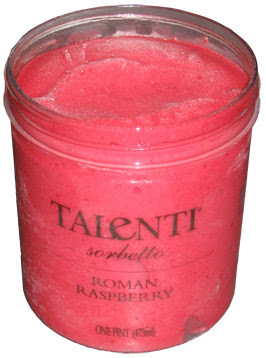 I love fresh raspberry very much and when it's out of season here comes Talenti with its greatest talent: raspberry sorbet. You gotta try it! Just tried the roman raspberry and it had a very strong plastic taste. Very disappointing.